System WP – Work Platform Nets is a specialized service offered by Fall Arrest Safety Nets and are a brilliant height safety solution. 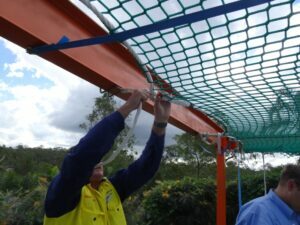 These nets are an innovative access system which can be quickly erected and dismantled in areas where access would otherwise be limited to large and bulky scaffolding systems. The supply and installation of Working Platform safety nets benefit the client commercially, economically and financially. Fall Arrest Safety Net’s work platform nets are a new approach to accessing difficult work locations such as below deck structures as are often found around bridges, piers, wharves and oil platforms. Work platform nets provide stable work areas for workers needing to carry out all tasks. The WP safety system provides a safe system for worker access which is tensioned between anchor points to provide a stable work platform suitable for a wide variety of applications. The nets are tough and highly durable, easy to store and transport. The working platform net has major benefits in locations where space and transportation considerations are critical. Work Platform nets are regarded as a reliable fall prevention working platform where personnel can work with confidence. Work Platform Nets can also be installed as a heavy duty containment system enabling protection to elements below from heavy dropped objects. The containment system may be installed to capture minute particles increasing up to large and heavy debris. This system is used extensively underneath conveyor belts where large or small objects become dislodged from the conveyor belt. Extremely strong yet lightweight and transportable, WP safety nets provide direct, unhindered and stable support for multiple personnel and their equipment.